Phil Gould has lauded Knights coach Nathan Brown for having the courage to backflip on playing Kalyn Ponga at five-eighth, recalling the time he nearly turned Brad Fittler into a lock. Ponga will return to fullback for Newcastle’s home game against the Dragons on Sunday, having played just three games at No.6. Gould also reflected on the absurdity of using Darren Lockyer, an all-time great, as a template for transforming fullbacks into five-eighths. He praised Brown for walking back his decision on Ponga. “Kalyn Ponga can take Newcastle to the finals as a fullback,” Gould said on his Six Tackles with Gus podcast. “I respect the coach’s decision and I respect his right to make that decision [to move Ponga to five-eighth]. What I respect even more is that after three weeks, he says, ‘You know what, let’s turn around and go back and start again’. “That takes great courage from the coach to do that. Nathan Brown, I respect his decision to put him at five-eighth, I respect even more that now he says, ‘You know what, maybe that’s wrong. Maybe I’ve got to put him back to fullback’. “I did that with Brad Fittler at a young age, too. I moved Brad Fittler to lock and regretted it; and he loved playing lock. “When Brad Fittler was a young fella, he was a centre coming through the system and then I eventually saw him as a great five-eighth. And for some reason, at some stage in my career I put him to lock. “I persevered for four or five weeks but then thought, ‘Nup, this is wrong. This is not going to be his future’. Then I put him back to five-eighth and he became one of the greatest of all time. Fittler played some lock for NSW, back when Laurie Daley was the Origin five-eighth and when No.13s were ball-playing forwards rather than ‘middle’ battering rams. But he was a champion No.6 at all levels of rugby league – as was Lockyer. The Brisbane icon was not an immediate success at five-eighth and he made the difficult transition under iconic coach Wayne Bennett. “Everyone uses the Darren Lockyer [example]. Darren Lockyer was a champion. An absolute champion, one of the greatest of all time,” Gould said. “And Darren Lockyer didn’t move there until he was 27, 28. He had a lot of football under his belt playing as a fullback and it was probably the right time to move him. Running the ball back from kicks and fielding kicks all the time can get physically wearing. “And when Darren went to five-eighth, Darren struggled for 12 or 18 months, too. It wasn’t a blazing success straight away and he was very heavily targeted, but he was such a tough … he’s a champion player, Darren Lockyer. 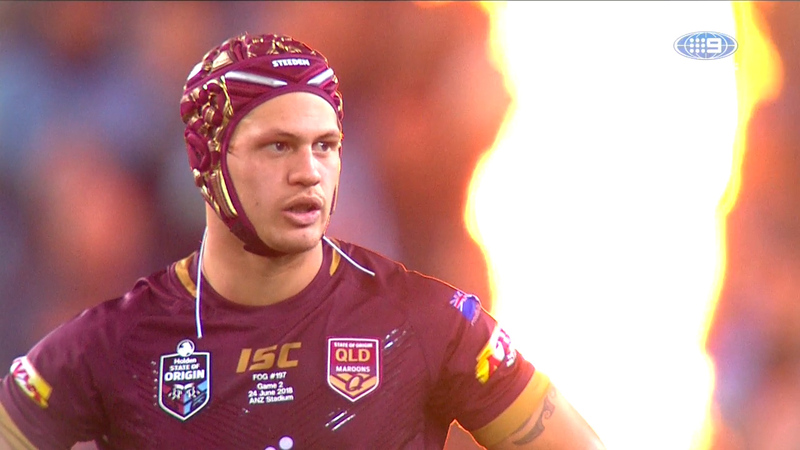 “Now, to be sending people down that path, you’re sending them down a Darren Lockyer path. It’s not Joe Blow from Erko, it’s Darren Lockyer. He was a champion and that’s why it worked. Gould also elaborated on his comments from 100% Footy on Monday night about former Panthers star Matt Moylan, another player who made an ill-fated move to five-eighth from fullback. Gould recalled that Moylan was a teenage No.6 who was switched to fullback because he too often ran across field in attack. He enjoyed the extra space at No.1 but in 2016, found himself starting an Origin game for NSW at five-eighth when he’d never even played the position in the NRL. Moylan was suddenly forced to look at No.6 as his preferred position, with James Tedesco seemingly closing the door on his representative opportunities as a fullback. “I was deadset against moving him to five-eighth and the first people to do it were not us, it was NSW,” Gould said. “I was really filthy on it at the time. I couldn’t say it, because he was our player, but it was not NSW Rugby League’s job to move that boy from one to six. It confused him for a long time. “To me, it’s been a waste of two or three years. Gould said that Moylan was clearly a better player at fullback, as he had demonstrated with his form for Cronulla so far this season.